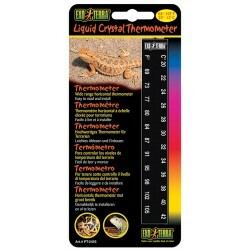 Reptile Thermometers & Hygrometers - The Serpentarium, Inc. 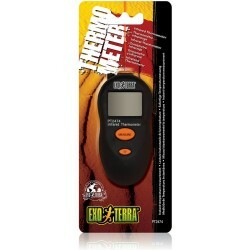 The Exo Terra Digital Thermo-Hygrometer is a 2-in-1 precision instrument, equipped with a remote combined sensor for accurate temperature and humidity indication. This precision instrument has a programmable minimum/maximum memory setting which can be controlled with a single button. 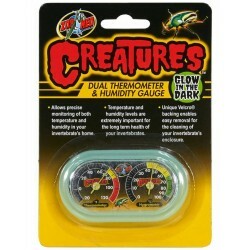 The Creatures Dual Thermometer and Humidity Gauge allows for precise monitoring of both temperature and humidity in your invertebrate’s habitat. Easy to set up! Glows-in-the-Dark! 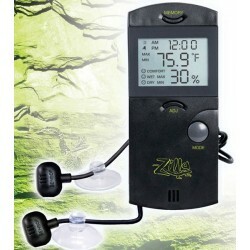 Zoo Med's Digital Thermometer and Humidity Gauge Combo! 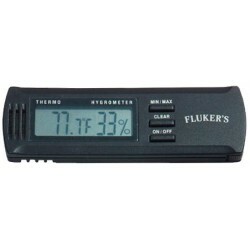 Fluker's Digital Display Thermo-Hygrometer provides two essential instruments for the price of one. 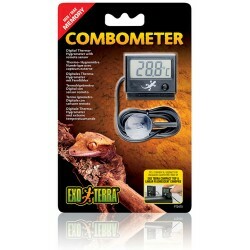 This simple-to-use device measures your terrarium's temperature and humidity with precision accuracy and features a clear digital display for easy reading. 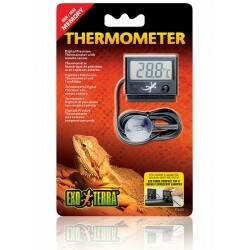 Cold-blooded reptiles stay healthier and more active with the accurate monitoring of a Digital Thermometer for Terrariums. Press a button to display temperatures from -10°F to 140°F (-23°C to 60°C) in either Fahrenheit or Celsius, graduated in 0.1° increments that reveal temperature trends long before they can harm pets. 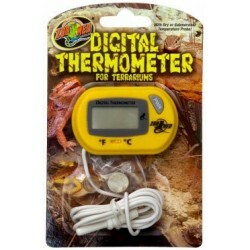 Digital Terrarium Thermometer with digital readout in Fahrenheit or Celsius. 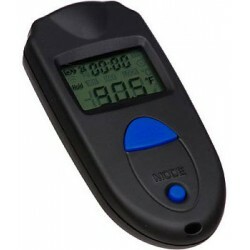 Has a remote sensor probe for accurate readings. At a single glance, a terrarium owner can monitor the two most critical environmental variables in reptile health and comfort. 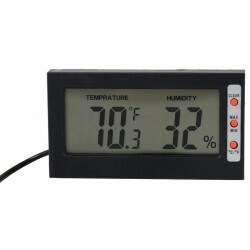 Both temperature and relative humidity are displayed on a large digital readout. A built-in calendar and alarm reminds pet owners to check conditions, make feedings or administer medications. 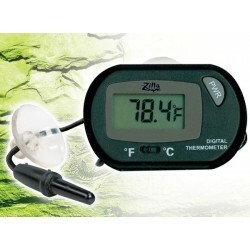 A very popular thermometer/Hygrometer that features a temperature/humidity sensor on a single external probe. Convenient for reptile and amphibian habitat monitoring and other uses. 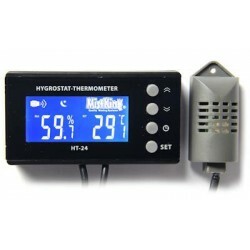 This controller works by constantly monitoring humidity on the probe. Based on current reading and required humidity HT-24 will activate the misting system as needed. Excellent choice when desired humidity needs to be achieved. Works with any existing MistKing system! 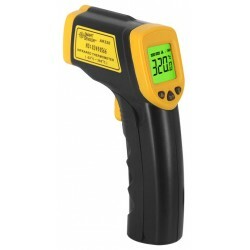 This Infrared Temp Gun features a 12:1 D:S ratio, compact styling, laser aiming, large back lit display and a unique 8 point laser aiming system. 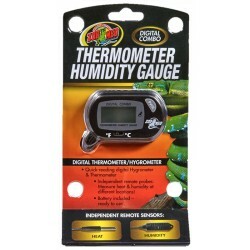 The REPTITEMP® Digital Infrared Thermometer is a small pocket sized Infrared Thermometer that instantly measures terrarium temperatures with the click of a button. This great tool allows keepers to monitor thermal gradients, basking sites, shelters, incubation and hibernation temperatures and more! 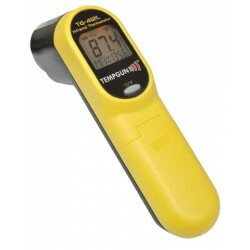 The TG-1 precisely measures reflected surface temperatures. An affordable Temp Gun, yet it maintains the same great accuracy and durability of more expensive units. Wrist strap Included.